Rho family GTPases are molecular switches best known for their pivotal role in dynamic regulation of the actin cytoskeleton. The prototypic members of this family are Cdc42, Rac1, and RhoA; these GTPases contribute to the breakdown of glomerular filtration and the resultant proteinuria, but their functions in normal podocyte physiology remain poorly understood. Here, mice lacking Cdc42 in podocytes developed congenital nephropathy and died as a result of renal failure within 2 weeks after birth. In contrast, mice lacking Rac1 or RhoA in podocytes were overtly normal and lived to adulthood. Kidneys from Cdc42-mutant mice exhibited protein-filled microcysts with hallmarks of collapsing glomerulopathy, as well as extensive effacement of podocyte foot processes with abnormal junctional complexes. Furthermore, we observed aberrant expression of several podocyte markers and cell polarity proteins in the absence of Cdc42, indicating a disruption of the slit diaphragm. Kidneys from Rac1- and RhoA-mutant mice, however, had normal glomerular morphology and intact foot processes. A nephrin clustering assay suggested that Cdc42 deficiency, but not Rac1 or RhoA deficiency, impairs the polymerization of actin at sites of nephrin aggregates. Taken together, these data highlight the physiological importance of Cdc42, but not Rac1 or RhoA, in establishing podocyte architecture and glomerular function. Renal podocytes are specialized epithelial cells that extend a series of actin-rich projections known as foot processes (FPs), which interdigitate to ensheathe the glomerular capillaries. A multiprotein complex formed between juxtaposed FPs establishes a porous cell junction known as the slit diaphragm, which serves as the final sieve of the glomerular filter.1 The stereotypical response of podocytes to injury is FP effacement characterized by loss of interdigitation and disruption of the slit diaphragm, resulting in proteinuria.2 During effacement, the actin cytoskeleton of FPs reorganizes from a parallel array of contractile bundles to a dense network of stress fibers.3 Mutations in actin-associated proteins that interact with the slit-diaphragm scaffolding protein nephrin, which include α-actinin-4, cofilin-1, Nck1/2, and CD2AP, result in proteinuric diseases,4–6 underscoring the interplay between maintenance of podocyte cytoarchitecture and integrity of the glomerular filtration barrier. The Rho family of small guanosine triphosphatases (GTPases) regulate actin cytoskeleton plasticity and thus facilitate changes in cell shape, motility, adhesion, polarity, cell cycle progression, and gene expression.7 As molecular switches, they fluctuate between guanosine triphosphate–bound active and guanosine diphosphate–bound inactive forms. Activation of the Rho GTPases Cdc42, which mediates formation of filopodia, Rac1 (a regulator of lamellipodia formation), and RhoA, which promotes stress fibers, has been implicated in nephropathy-related signaling events; these findings suggest that these proteins may be important in podocytes, particularly in a pathologic context.8–13 However, the relevance of Rho GTPases in normal podocyte physiology is undefined, and a genetic characterization of these proteins is therefore important. Nphs2-Cre:Cdc42flx/flx conditional knockout (cKO) mice were born in an expected Mendelian ratio and were largely indistinguishable from control littermates. However, elevated levels of albumin were already detectable in the urine of Cdc42 cKO mice at birth (postnatal day 0) (Figure 1A). The level of proteinuria expressed as a ratio between urinary protein and creatinine was more than 15-fold higher in Cdc42 cKO mice than in control littermates, and the severity worsened by postnatal day 5 (Figure 1B). Cdc42 cKO mice eventually died of renal failure within 2 weeks of age. This perinatal lethality was 100% penetrant, and no Cdc42 cKO mutants reached weaning age (postnatal day 21). In contrast, Nphs1-Cre:Rac1flx/flx and Nphs2-Cre:RhoAflx/flx mice did not develop proteinuria by 3 months of age (Figure 1C) and showed no overt deterioration in health or decline in weight relative to control littermates, even after 12 months of age. These genetic findings collectively demonstrate that loss of Cdc42 but not Rac1 or RhoA in podocytes leads to rapidly progressive renal failure. Podocyte-specific ablation of Cdc42 but not Rac1 and RhoA causes congenital nephropathy. (A) Protein gel electrophoresis demonstrates distinct proteinuria in Nphs2-Cre: Cdc42flx/flx cKO animals at postnatal day 0 (P0). (B) Extent of proteinuria expressed as a ratio between urinary protein and creatinine concentrations from pups at P0 and postnatal day 5 (P5). (C) Absence of proteinuria in 3-month-old Rac1 and RhoA cKO mutants in contrast with P10 Cdc42 cKO mutant. (D–M) Periodic acid-Schiff staining of kidney sections from Cdc42 cKO animals compared with control littermates showing glomerular and tubular dilatation as early as P0 (E) and extensive glomerulosclerosis at P5 (G). By postnatal day 12 (P12), collapsed glomeruli with adhesions to the Bowman capsule can be seen (M), as well as microcystic parenchyma filled with protein casts (I and K). Histologic analysis of kidneys from Cdc42 cKO mutant animals on postnatal day 0 demonstrated glomerular and proximal tubule dilatation typical of congenital nephropathy (Figure 1, D and E). Glomerulosclerosis was evident by postnatal day 5, with erythrocytes occasionally found accumulating in the Bowman capsule of sclerotic glomeruli (Figure 1, F and G). By postnatal day 12, mutant kidneys showed severely microcystic tubulointerstitia, with massive proteinuria clearly evident as proteinaceous casts filling tubular lumens (Figure 1, H and K). Furthermore, extensive glomerular collapse and adhesion to the Bowman capsule (synechiae) had occurred by this timepoint, indicating advanced renal failure (Figure 1, L and M). Ultrastructure analysis revealed that Cdc42 cKO mutant podocytes had abnormally broad FPs that displayed widespread segmental effacement at birth (Figure 2, A–D). Of note, adjacent mutant FPs appeared to be joined by multiple junctions that were apically mislocalized and were distinct from basolateral slit diaphragm in control animals (Figure 2; Supplemental Figure 1). By postnatal day 5, Cdc42-deficient podocytes assumed an amoeboid structure with globally flattened FPs characterized by blebs and microvillar appendages (Figure 2, E–H). In contrast, histologic and ultrastructural analysis of kidneys from Nphs1-Cre:Rac1flx/flx and Nphs2-Cre:RhoAflx/flx mice at 3 months of age showed an unremarkable glomerular structure and intact FPs, consistent with their lack of proteinuria (Supplemental Figure 2). Loss of Cdc42, Rac1, and RhoA expression in podocytes in the respective cKO mutants was confirmed by immunofluorescence (Supplemental Figure 3). Taken together, these data strongly indicate that Cdc42 is essential in establishing the normal structure of podocyte FPs, and its absence causes severe glomerular dysfunction. Cdc42 deficiency in podocytes leads to congenital FP effacement. 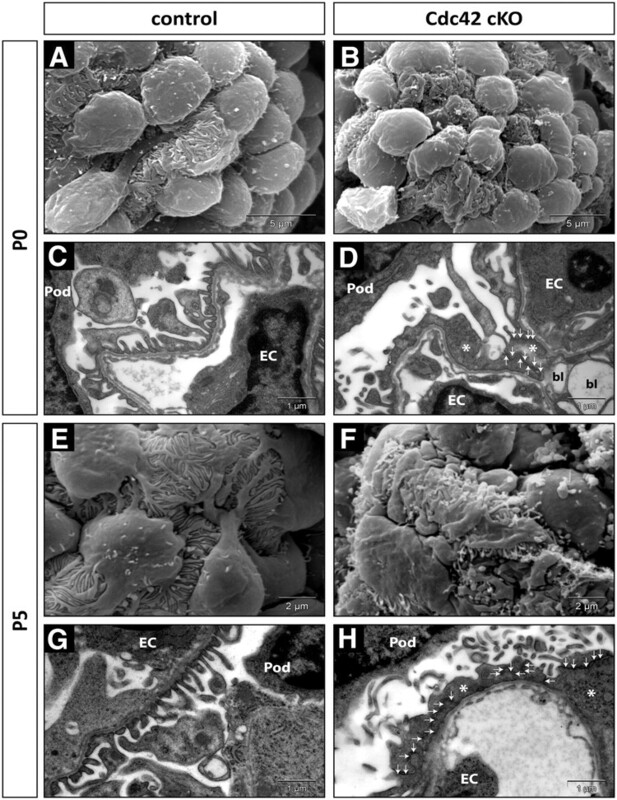 Scanning (A, B, E, and F) and transmission (C, D, G, and H) electron micrographs of glomeruli show extensive FP effacement (asterisks) in Cdc42 cKO mutant podocytes. Abnormal adhesion complexes (arrows) and blebbing (bl) were also evident in FPs of Cdc42 cKO mutants. Mutant podocytes have globally effaced FPs with numerous ciliary projections by postnatal day 5 (P5) (F and H). EC, endothelial cells; P0, postnatal day 0; Pod, podocytes. Intrinsic damage to the slit diaphragm in the absence of Cdc42 was assessed using immunofluorescence for several podocyte markers and cell polarity proteins. Compared with littermate controls at postnatal days 0 and 5, expression of nephrin and podocin was significantly downregulated and showed patchy distribution within the glomeruli of Cdc42 cKO mutant kidneys, whereas expression of synaptopodin remained unchanged (Figure 3; Supplemental Figure 4). A striking reduction in ZO-1, Par3, and aPKCλ/ι expression could also be seen in glomeruli of Cdc42 cKO mutant kidneys, and their distribution was punctate compared with that of controls (Figure 3). These results imply that Cdc42 is essential for maintaining the integrity of the slit diaphragm and for establishing podocyte cell polarity. 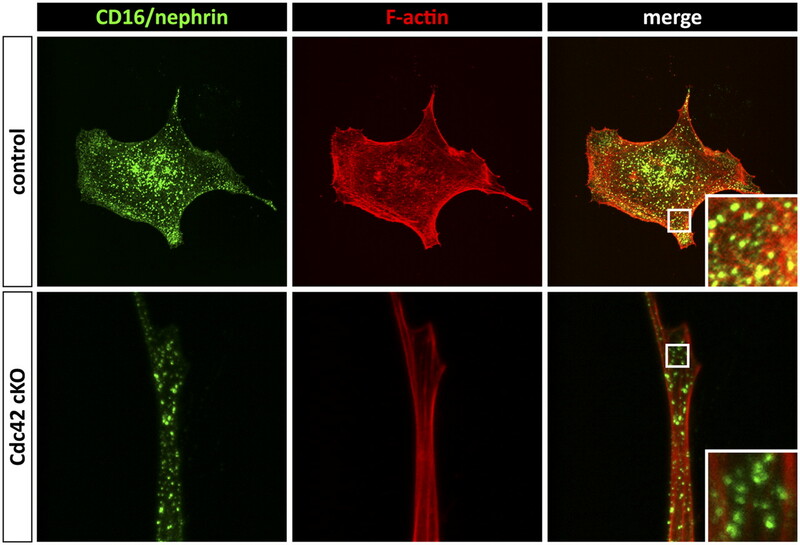 To investigate whether these changes in FP structure might be attributed to a role of Cdc42 in nephrin-mediated regulation of the actin cytoskeleton, we conducted a nephrin clustering assay in primary mouse embryonic fibroblasts (MEFs) obtained from Cdc42flx/flx embryos. We have previously shown that antibody-mediated clustering of a CD16-nephrin chimeric protein but not CD16 alone results in formation of actin polymers at sites of clustered punctae in the presence of Nck1/2.14 MEFs expressing CD16-nephrin or CD16 alone (not shown) were transduced with Cre-expressing adenovirus to inactivate Cdc42 expression (Cdc42 cKO). Staining of uninfected control cells with fluorescent phalloidin showed initiation of actin comets that co-localized with clustered CD16-nephrin punctae, whereas removal of Cdc42 via Cre-transduction disrupted both cell shape and the formation of actin comets in cells with clustered CD16-nephrin (Figure 4). To ensure that this effect was specific to Cdc42, similar experiments were performed using MEFs derived from Rac1flx/flx and RhoAflx/flx mice. Although Cre-mediated removal of Rac1 or RhoA also altered cell structure, actin comets formed and co-localized with clustered CD16-nephrin punctae (Supplemental Figure 5). Together, these results suggest that Cdc42, but not Rac1 or RhoA, is required to coordinate actin polymerization with organization of components of the slit diaphragm, such as nephrin. Aberrant expression of components of the slit diaphragm in the absence of Cdc42. Immunofluorescence analysis reveals reduced and punctate expression of nephrin, podocin, ZO-1, Par3, and aPKCλ/ι in Cdc42 cKO mutant glomeruli compared with control littermates at postnatal day 5. In contrast, synaptopodin (Synpo) expression appears unaffected in the absence of Cdc42. Wheat germ agglutinin (WGA) counterstain highlights the glomerular basement membrane. Original magnification, ×200. Cdc42 is required to initiate actin polymerization after clustering of nephrin. MEFs obtained from Cdc42flx/flx embryos were transduced with Cre-expressing adenovirus (Cdc42 cKO) or left untreated (control). Cells were next transfected with CD16-nephrin, and clustering was induced with anti-CD16 antibody (green). Fluorescent phalloidin (red) shows polymerized actin that co-localizes with CD16-nephrin punctae in control cells but not in Cdc42 KO MEFs. Original magnification, ×1000. Our findings demonstrate the essential requirement for Cdc42 and the dispensability of Rac1 and RhoA in podocytes. Filopodial protrusions, which form upon activation of Cdc42 in many cell types (including cultured podocytes), have an interesting resemblance to FPs with regard to their cytoskeletal backbone, as they also consist of parallel bundles of actin filaments.12,17–19 Indeed, Cdc42 null MEFs are unable to form filopodia,20 and several downstream effectors of Cdc42, including WASP/N-WASP, mDia2, and IRSp53, have all been implicated in the formation of filopodia.7 The flattened phenotype of Cdc42-deficient podocytes may indicate the requirement for Cdc42 activity in the formation of F-actin bundles that reinforce normal FP. In addition, the results from our nephrin clustering assay and the pronounced loss of nephrin and podocin expression in Cdc42-deficient glomeruli indicate that Cdc42 is required to couple the slit diaphragm to actin polymerization. Furthermore, altered localization of Cdc42 has recently been implicated in cases of Charcot-Marie-Tooth disease with associated FSGS, wherein the Cdc42-binding formin protein INF2 is mutated.21 Another conserved role of Cdc42 is in the regulation of cell polarity. Active Cdc42 can bind the polarity complex proteins Par3 and Par6 and regulate the enzymatic activity of the associated atypical protein kinase Cλ/ι (aPKCλ/ι).22 Polarity protein complexes are found in podocytes and regulate the correct localization of the slit diaphragm. For example, mice deficient in aPKCλ/ι showed polarization defect in podocytes, loss of nephrin expression, and death from renal failure by 6 weeks of age.23,24 The similar appearance of irregular cell adhesions and loss of cell polarity proteins ZO-1, Par3, and aPKCλ/ι within Cdc42-deficient glomeruli strongly suggest that both the actin-regulatory and polarity functions of the Cdc42 GTPase are required for proper podocyte architecture and function. The contrasting lack of an overt phenotype in mice selectively lacking Rac1 and RhoA in podocytes is consistent with findings in previous studies implicating active states of these particular GTPases in glomerulopathy. In a salt-induced hypertensive nephropathy model, pharmacologic inhibition of Rac1 ameliorated renal damage.9,11 In addition, inactivating mutations of Arhgap24 in humans, a Rac1-specific GTPase-activating protein that is upregulated in differentiated podocytes, have recently been linked to FSGS; in contrast, mice lacking RhoGDIα, which functions to sequester Rho GTPases from the plasma membrane, develop progressive nephrotic syndrome that can be alleviated by inhibition of Rac1.11,25,26 Similarly, blockade of RhoA-ROCK signaling in diabetic and puromycin aminonucleoside nephropathy models specifically abrogated proteinuria while constitutive activation of RhoA in podocytes perturbed process formation in vitro and caused FSGS in vivo.8,10,13,27 The notion that stress fibers replace actin bundles in effaced FP aligns well with the role of active RhoA in pathologic transformation of podocytes.3 Together, these studies support the idea that suppression rather than activation of Rac1 and RhoA may be more relevant for normal podocyte function. In summary, we demonstrate that podocyte-specific inactivation of Cdc42 but not Rac1 or RhoA leads to congenital nephropathy. Our findings highlight the essential role played by Cdc42 in regulating actin cytoskeleton dynamics and cell polarity, both of which are needed for normal podocyte structure and establishment of a functional glomerular filtration barrier. Mouse strains with floxed alleles for Cdc42, Rac1, and RhoA have been described elsewhere.28–30 Podocyte-restricted knockout mutants for cdc42, Rac1, and RhoA were generated by crossing floxed mice with Nphs1-Cre or Nphs2-Cre transgenic mice.14–16 All mice were maintained on a mixed genetic background. Husbandry and ethical handling of mice were conducted according to guidelines approved by the Canadian Council on Animal Care. Kidneys fixed in Histochoice or 10% phosphate-buffered formalin were paraffin embedded and sectioned to 1-µm thickness. Paraffin sections were stained via periodic acid-Schiff method. For immunofluorescence, Histochoice-fixed kidneys were equilibrated in 30% sucrose and cryosectioned. The following primary antibodies were used in this study: goat anti-nephrin (R&D Systems, Minneapolis, MN), rabbit anti-podocin (Sigma-Aldrich,St. Louis, MO), rabbit anti-aPKCλ/ι (Cell Signaling Technology, Danvers, MA), rabbit anti-Par3 (Millipore, Billerica, MA), mouse anti-ZO-1 (Life Technologies, Grand Island, NY), mouse anti-synaptopodin (ARP Inc., Waltham, MA), goat anti-podocalyxin (R&D Systems, Minneapolis, MN), mouse anti-Rac1 (Cytoskeleton, Inc., Denver, CO), mouse anti-Cdc42, and mouse anti-RhoA (Santa Cruz Biotechnology, Santa Cruz, CA). Cryosections were counterstained with wheat germ agglutinin-Texas Red or concanavalin A-Alexa Fluor 647 conjugate (Life Technologies). Immunofluorescence was observed by confocal microscopy on a Nikon Eclipse Ti instrument. Urine was collected and analyzed for albumin levels by protein gel electrophoresis followed by Coomassie blue staining. Colorimetric analysis of urinary protein and creatinine was done using a BCA Protein Assay Kit (Thermo Scientific, Rockford, IL) and a modified Jaffe reaction, respectively. Dissected kidneys were fixed in 0.1 M cacodylate buffer containing 4% paraformaldehyde and 2% glutaraldehyde. For transmission electron microscopy, specimens were postfixed in 1% OsO4, dehydrated, and embedded in Quetol-spurr resin. Ultrathin resin sections stained with uranyl acetate and lead citrate were viewed using an FEI CM100 transmission electron microscope (FEI, Hillsboro, OR). Kidneys for scanning electron microscopy were sliced open with a razor, dehydrated, and sputter-coated with gold. Gold-coated specimens were observed using an FEI XL30 scanning electron microscope. MEFs were obtained from E13.5 embryos homozygous for floxed Cdc42, Rac1, and RhoA. MEFs were transduced with Cre adenovirus (Vector Biolabs, Philadelphia, PA) to delete the floxed alleles and abrogate expression of specific Rho GTPases. MEFs were also transfected with constructs encoding CD16 alone or chimeric CD16-nephrin using Effectene (Qiagen, Valencia, CA). Clustering of CD16 induced by antibodies was performed as described elsewhere.14 Cells were fixed in 4% paraformaldehyde and stained with a phalloidin-Texas Red conjugate to visualize F-actin. Co-localization of CD16 punctae and phalloidin-positive actin comets were assessed by confocal microscopy. The Nphs1-Cre and Nphs2-Cre transgenic mice were kind gifts from Dr. Susan Quaggin (SLRI, Toronto, Ontario, Canada). We are indebted to Douglas Holmyard (Advanced Bioimaging Centre, Mount Sinai Hospital, Toronto, Ontario) and to Patricia Fuegas and Lilly Morikawa (Centre for Modeling of Human Diseases, Toronto, Ontario) for help in processing tissue specimens for electron microscopy and histology. We are also grateful to Geraldine Mbamalu (SLRI, Toronto, Ontario) for technical assistance. This work was supported by operating grants from the Canadian Institutes of Health Research (MOP-57793 to T.P.) and the Kidney Foundation of Canada (to R.P.S./T.P. and to N.J.). N.J. is a recipient of a New Investigator Award from the Kidney Research Scientist Core Education and National Training (KRESCENT) Program. S.P.H. was supported by a Canada Graduate Scholarship from CIHR. Animal studies were conducted at the Toronto Centre for Phenogenomics. See related editorial, “Knocking Out Podocyte Rho GTPases: And the Winner Is…,” on pages 1128–1129. This article contains supplemental material online at http://jasn.asnjournals.org/lookup/suppl/doi:10.1681/ASN.2011121206/-/DCSupplemental.